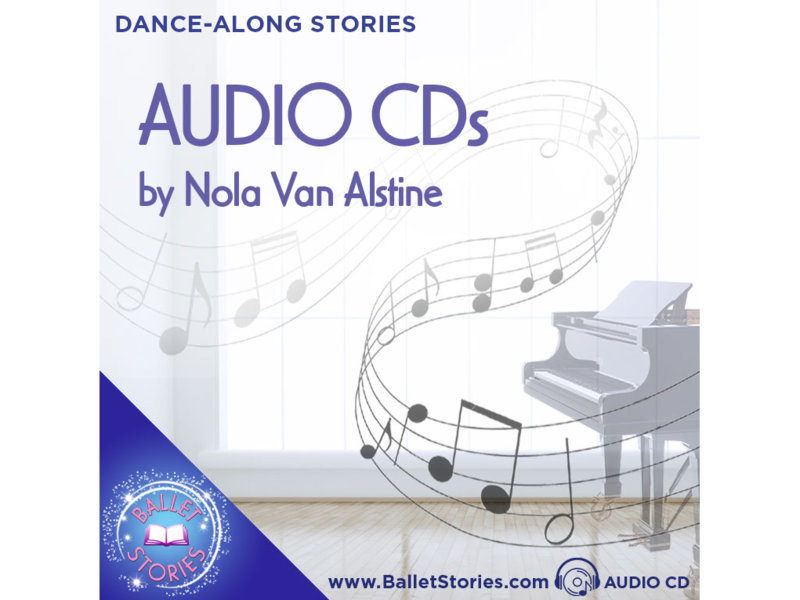 BalletStories.com teaches young children ballet with e-books, videos, and audiobooks by Nola Van Alstine. Become a Ballerina Member for free. 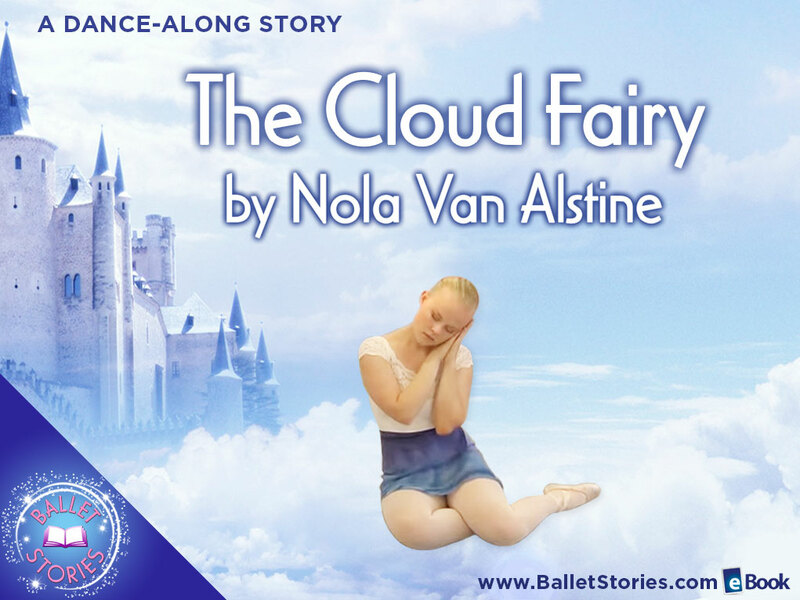 Scroll down to learn more, or watch The Cloud Fairy trailer now. 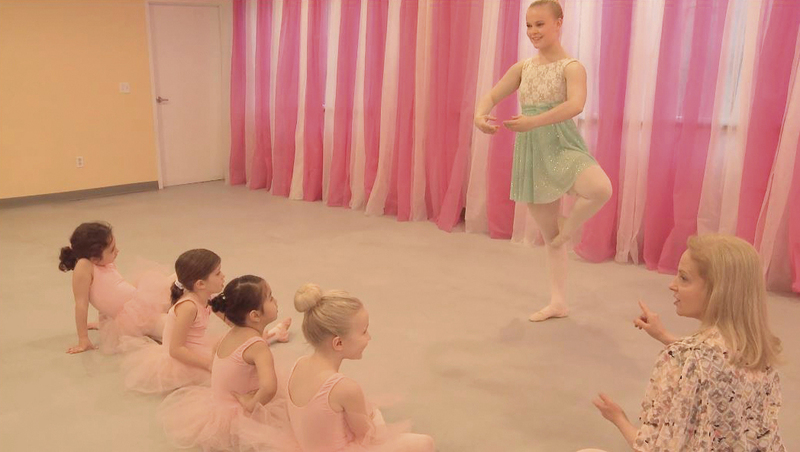 Miss Nola has taught 1000’s of young students ballet in her own dance studio, Dance Adventure, in Greenwich, Connecticut. Miss Nola’s stories appeal to all young children who appreciate ballet. Now children can watch these videos and dance along with her students at home. Listen to Nola narrate original stories in her E-Books. 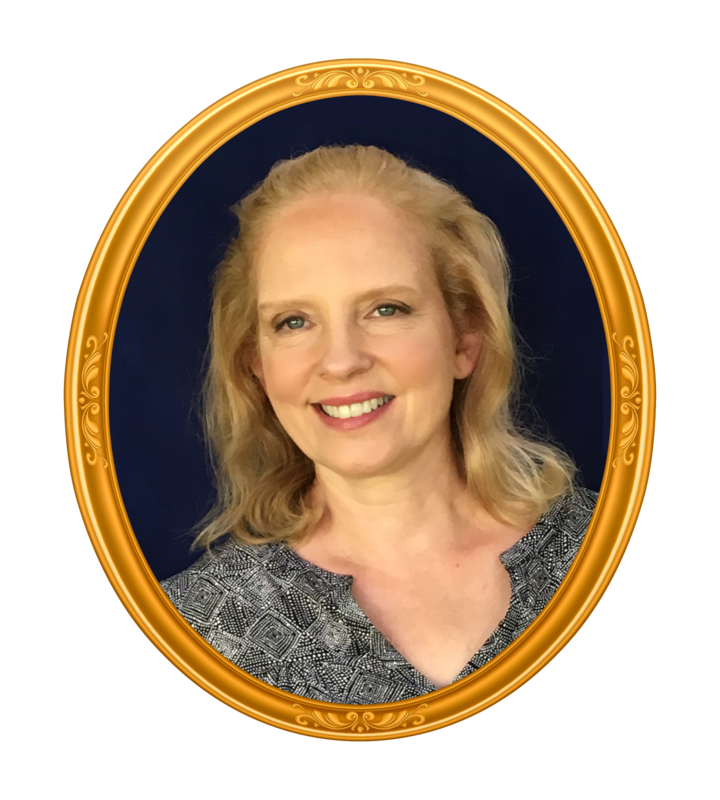 Join for Free, and dance along as she tells her stories accompanied by Eric on piano in her Audiobooks. View Trailer of The Swan Princesses. Miss Nola has over 100 different stories, and each starts with a group of students in her dance studio. What they do and learn is always fascinating. Our first four videos are now available for viewing. These “live” classes were shot in one or two takes. After a general walk-through rehearsal with these talented dancers, ages four through six, we just let the camera roll. Miss Nola narrates her original stories, and each story comes alive with photos from the video in her E-Books. You can read alone or hear her tell the story. Miss Nola and her piano accompanist, Eric, also recorded audiobooks for each story. Now your child can experience and dance to these online e-books and audiobooks over and over again at home. Each of Miss Nola’s stories highlights different steps and ballet technique. In these short video segments, Miss Nola and her dance assistant, Miss Lydia, demonstrate steps which are important in that story. Miss Lydia was a student of Miss Nola’s from the age of three, and she also learned ballet growing up with many of these same stories. Bring along your imagination and love for ballet. A group of dancing princesses are practicing ballet in the castle garden with their friend, the Cloud Fairy. Each day, she floats down from the sky to join them and they dance beautifully together. One morning, the princesses are surprised to find that the fairy is too sleepy to dance. The princesses realize that their magical friend has a problem that only they can solve. See what wonderful things happen when you help a friend. In a magical kingdom of dance, there are young ballerinas who specialize in different ballet steps. Along comes one of Miss Nola’s good friends, Fairy-One-Step, who can only dance one ballet step. The fairy doesn’t know what to do when she receives an invitation to the Queen’s ball. Luckily, the young ballerinas are not far away and hear her story. Find out what happens when you help others what you know! A group of young ballerinas, start out as “young swans” in their nest in the Queen’s garden. The Queen loves the swans, but as they grow older the young swans want to fly off on their own. They fly to the top of a mountain with a lake and practice their ballet while watching their reflections. After awhile, they become homesick and want to return to their nest—but they have transformed. 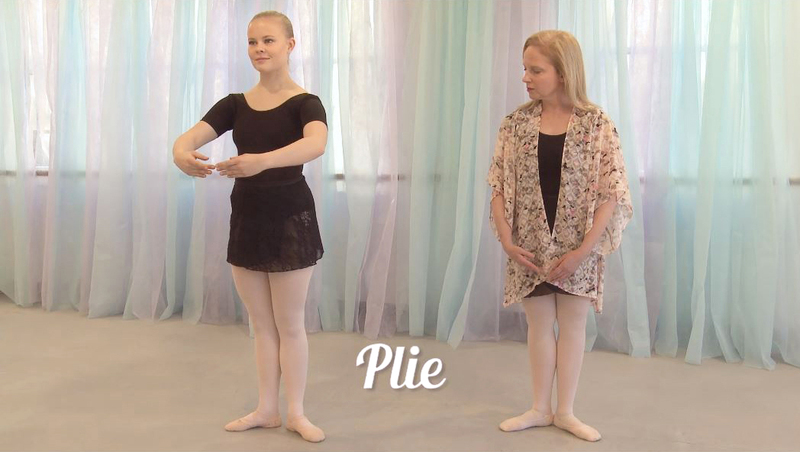 Find out what can happen when you really practice ballet! 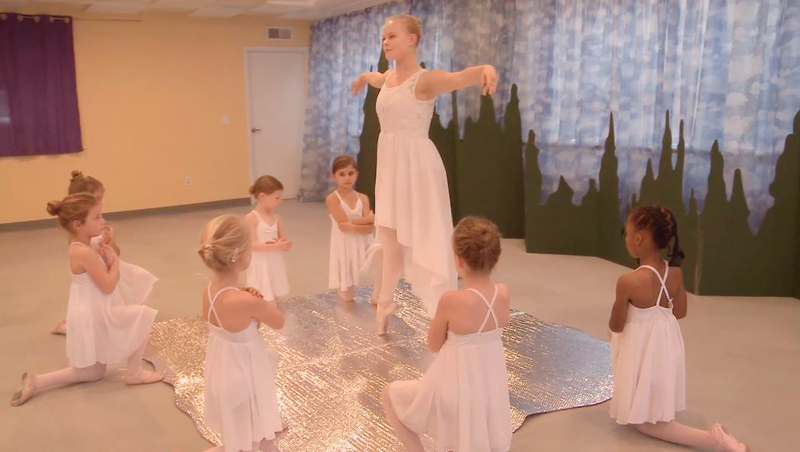 A group of young ballerinas enter a mysterious place—or so it seems. Actually, it is an empty dance studio with four corners. In each corner the children find a piece of the puzzle; wonderful things that are used by a ballerina in the dance studio. After exploring each corner, they can hear someone entering. The young dancers hide at first, but are pleasantly surprised. Find out who they meet and what good things can happen with new friends! Miss Nola narrates each story illustrated by video stills and creative graphic design. Each of Miss Nola’s original stories brings a group of children through an adventure into the world of dancing, ballet and new friends. Listen to Miss Nola narrate and read her stories aloud. You will want to move with the music as Eric, the pianist, accompanies her and dramatizes each story with beautiful music. Hear these dramatic recordings and dance along wherever you are, when you use both your imagination and ballet technique. COMING SOON! Starting at Miss Nola’s dance studio, the children practice ballet. The group realizes they are not alone, and they are joined by their friend, The Cloud Fairy. She dances beautifully down from the sky, and you’ll want to find out what happens and how the children help. OTHER TITLES COMING SOON! Miss Nola and Miss Lydia demonstrate ballet steps and movement from the videos. Miss Nola and Miss Lydia demonstrate Port de Bras (Carriage of the Arms). Port de Bras is a ballet movement used by the Cloud Fairy to spread her wings and give the impression of flying. The two dancers demonstrate how this movement and variations of it can be used in ballet. Children at home are encouraged to try it. Miss Lydia demonstrates the step, Chassé, which means “to chase.” One foot chases the other across the floor. In Fairy-One-Step, this was the only step the fairy knew how to do. It is a gliding step where one foot chases the other foot out of its position, and it can be used in all directions. Children are encouraged to try this step at home. 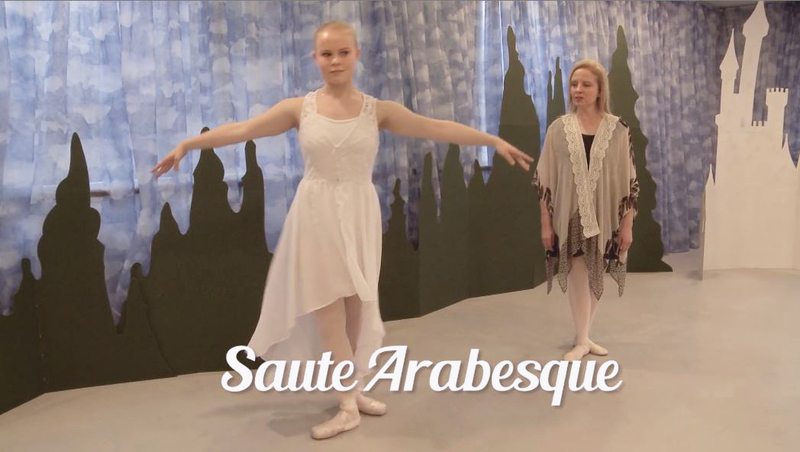 Miss Lydia demonstrates how to make a traveling ballet step called Saute Arabesque. The step was used by the Swan Princesses in the video to fly far, far away. An Arabesque is a position where the dancer stands on one leg while extending the other leg straight to the back with pointed toes. Saute means to jump. Step into your arabeque position with a jump up into the air then repeat with the opposite leg across the floor. Miss Nola and Miss Lydia demonstrate the step, Demi-Plié, which is used in this story by the children dancers in The Four Corners. Usually one of the first exercises practiced in class, it is a small knee bend. When practicing a demi- plie, start with first position. Bend your knees as far as you can while still keeping both heels planted on the ground. Knees should bend outward over the feet, while the back is held straight. Children are encouraged to try this step at home. This is a map of the places and friends you may have visited. The map is magical in that it knows your name and remembers everywhere you have been and everyone you have met in your travels with Miss Nola. THIS MAP IS COMING SOON! Access full content on our Member Content page. Click Here to Register Now! Get ready for our new release. Expect to see some new faces and returning friends as Miss Nola’s studio becomes the place we meet and start our travels. Experience the drama and dance along with us. Listen to Miss Nola read her stories as you read along. Photos illustrate and show places and friends. The Audiobooks are for you to dance along with. Miss Nola narrates her stories while Eric plays the piano. Join Miss Nola’s friends in different places as you dance through her world. Your name will display on the map and you can see where you have been and new friends you’ve made on imaginary roads and lands. For a limited time, all memberships are free. We will create a rotating repetoire of videos, ebook, audiobooks and ballet technique videos. Please invite your friends to join on social media with a free membership! 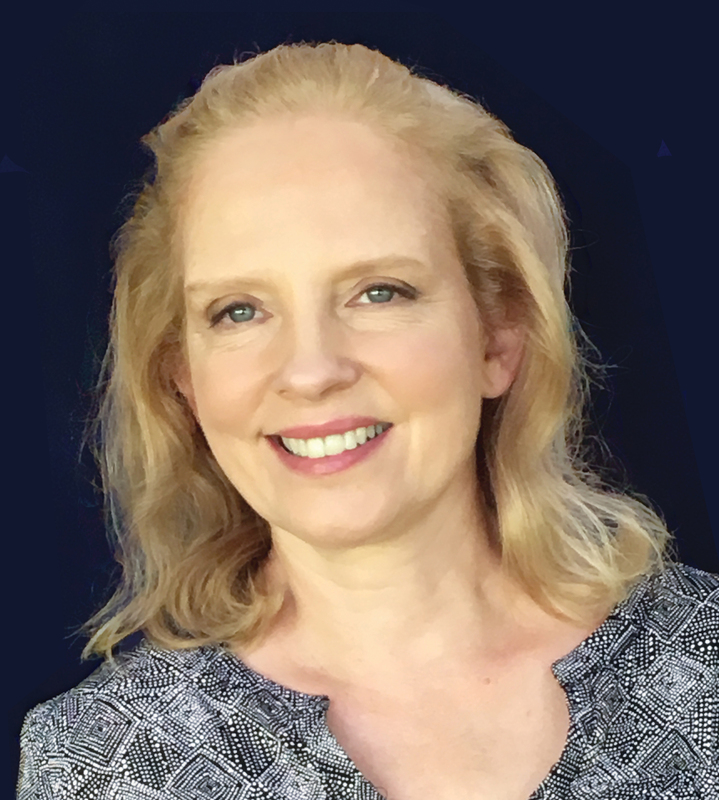 Miss Nola is the director of her own dance studio, Dance Adventure, in Greenwich, Connecticut. 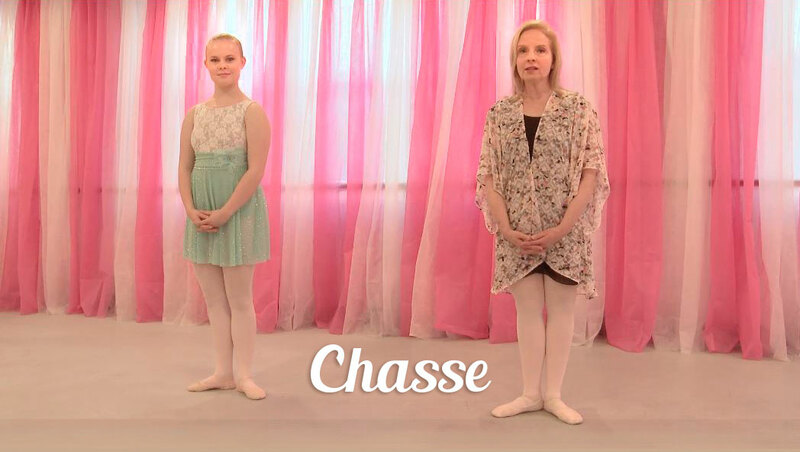 She writes stories and teaches ballet to young dancers. In fact, she has taught many thousands of dancers over the past years. She has a husband, two sons, two cats, one dog, fifteen fish and lives with a big yard filled with animal friends including a big blue heron and some playful river otters. Miss Lydia is a wonderful dancer and is Miss Nola’s dance assistant and a guest performer in many of Ballet Stories’ videos. She remembers studying for many years at Dance Adventure. She was Miss Nola’s student from the age of two. In fact, she learned her first ballet from so many of Miss Nola’s stories, she knows many of them by heart. She is studying many subjects at college including dance, and she really likes children, of course. Eric is an accomplished pianist and conductor. He has been Miss Nola’s piano accompanist for many years and knows how to play music for many of Miss Nola’s stories. He is a wonderful improviser and combines ballet repertoire with his own variations and compositional skills as a musician. 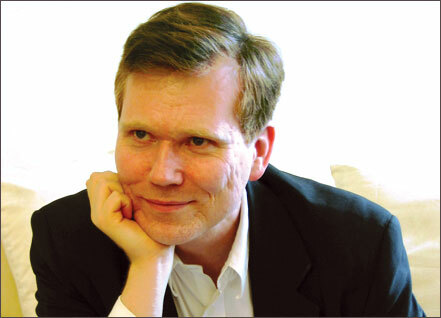 Eric is an active performer, a conductor and Director of the Collegium Westchester Orchestra and Choir. Copyright © 2016 All Rights Reserved | BalletStories.com, a division of Dance Adventure Inc. or www.DanceAdventure.com. Please invite other families with young children to join. We will email them a link: "Try this free ballet site."